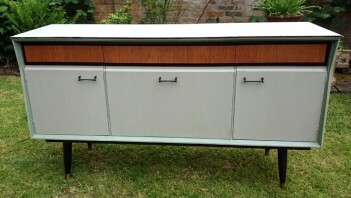 This retro sideboard was manufactured in 1981. It has typical 70's styling, and comes complete with a detatchable drinks tray. We have painted the outside using Grand Illusions Vintage Paint in Shutter grey, and have picked out details in Charleston green and Noir black. We finished it with a coat of Grand Illusions Simply matt varnish. We have kept the drawers in their original finish, and the inside has been left unpainted. The central drawer has 3 dividers, for cutlery, the central cupboard has a set back shelf, mirrored back and the tray. The right hand cupboard as no shelf, the left hand one, has a single shelf.